Cut out the Thing templates and hot glue the paper to the front of the shirt. Dress the child in shirt, pants, mittens and blue cap. For a more girly Thing, one can make a tutu out of elastic and tulle (red, white and/or blue). See How to Make a Tulle Skirt for Halloween and Dance Costumes. Then, add red and white striped leggings or tights under the ladies tutu skirt. 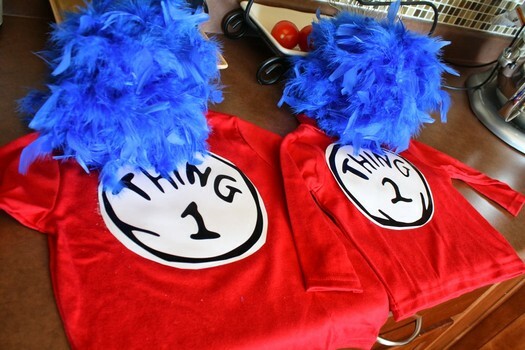 While these tee shirts are fairly inexpensive and simple to purchase, making your own Thing costume is a fun family craft activity that is easy to complete. 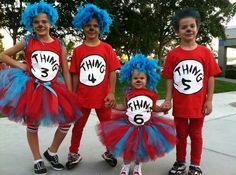 Simply add the Dr. Seuss accessory kit for a tag a long Cat in the Hat.